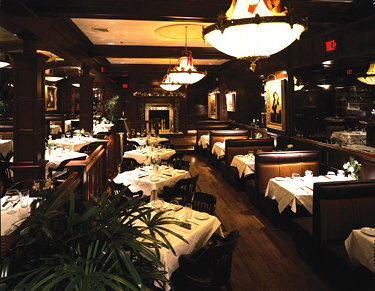 This classic, upscale steak house presents fine dining in an atmosphere of timeless elegance, offering guests the finest cuts of prime meats, fresh seafood and much more. The Abe & Louie's experience focuses on providing undeniably superior service and classically prepared cuisine in a truly impressive setting. Well-versed attendants provide excellent service, while the executive chef and his staff adeptly orchestrate the preparation of a variety of classic favorites. Oversized leather courtroom chairs and Hollywood-style booths in the dining room create an inviting atmosphere; bronze chandeliers, massive torchieres and a gold leaf barrel vault ceiling add an air of elegance. Abe & Louie's is indeed the essence of style. An attractive private dining room and Louie Louie, an upscale, classic lounge on the second level, are available for special events.